CU-Chicken Health: How Do I Clip Chicken Wings? How do I clip my Chicken’s Wings? May I first suggest that you clip only if it is necessary, because this will make themselves vulnerable to predators. 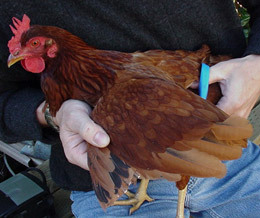 Wing clipping, the most common method of controlling the flight of backyard chickens, involves using sharp shears to cut off the first ten flight feathers of one wing…. May I first suggest that you clip only if it is necessary, because this will make themselves vulnerable to predators. 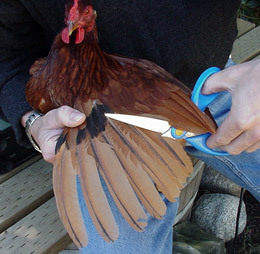 Wing clipping, the most common method of controlling the flight of backyard chickens, involves using sharp shears to cut off the first ten flight feathers of one wing. Clipping causes a bird to lack the balance needed for flight but lasts only until new feathers grow during the next molt, which may be a few months in young birds or up to a year for older ones. Wing clipping doesn't seem to hurt the bird at all, and isn't noticeable when they are walking around. The primary flying feathers are hidden underneath when the wings are folded. Also, the flying feathers are easy to pick out -- often a different color than the rest. Make sure to use a SHARP scissors. If you carefully follow the diagram above you won't come close to any blood feathers. It is absolutely imperative that you do not cut any new growth feathers with blood in the shaft. You should be able to tell the difference because the shaft will have a pinkish hue to it. Sometimes darker colored birds require holding the wing up to the sun to be able to clearly tell if they are new growth feathers. 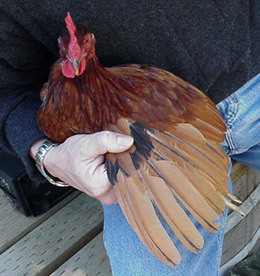 Cutting these feathers causes major pain to the chicken and major blood loss.